The EZPay screen in CIM GOLD offers users several options when setting up recurring payments. Perhaps your customers want to pull their recurring payments a couple of days before their scheduled Due Date. This is not an uncommon practice. Other customers may want to pull their payment 10 or more days prior to their payment Due Date or setup on a specific day of the month. GOLDPoint Systems’ EZPay offers both options. Your GOLDPoint Systems account manager can set up the EZPay Options on the EZPay IMAC Table, which is a screen in CIM GOLD they have access to. The following pages will focus on the EZPay Option Recurring Payment Use Days Before with and additional setting for Recurring Monthly option set. (We will discuss the recurring payment frequency options in a future blog). When the Recurring Payment Use Days Before option is set for your institution on the EZPay IMAC Table (see below). EZPay will display the Recurring Payments group box with the Due Date and a drop-list for “NN days prior to Due Date.” The maximum number of days prior to Due Date are nine. 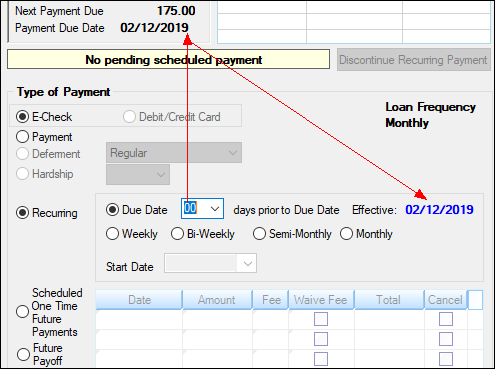 By entering “00” days, the screen will display the Due Date as the Effective date of the payment, as reflected in the upper portion of the screen (as shown below). 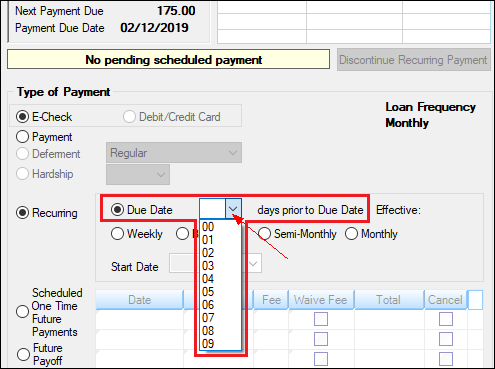 If the customer should ask for their payment to be three days prior to their Due Date, this drop-list makes it easy for the user to select the correct date. However, as stated earlier, this drop-list has a maximum of nine days prior to the Due Date. 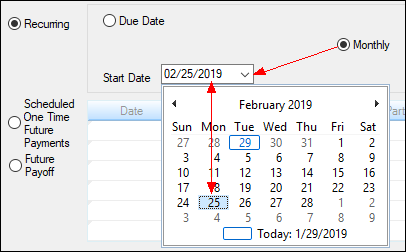 You may need to use a different option if the customer wants to set the date to a specific day of the month or for earlier than nine days before the Due Date. In the example below, the customer’s Due Date lands on the 28th. They would like to make their payments on the 15th of every month. 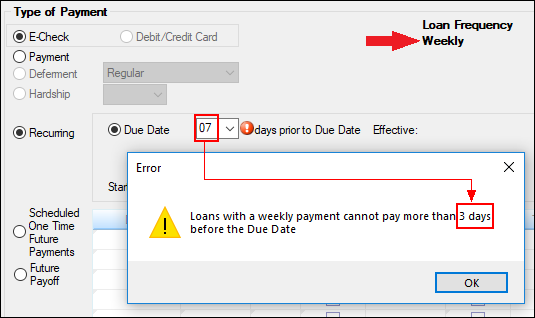 Using the drop list, setting the payment out 10 days before the Due Date is not possible. In this scenario, the user would need to select the Monthly option, then use the Start Date calendar date picker to select the 15th of the month. Note: To make this change for the current payment, both the Due Date and the selected Start Date must be greater than today’s date. When the Recurring Payment Use Days Before option is not set on the EZPay IMAC Table (see below). EZPay does not display the Days prior to Due Date drop-list on the EZPay screen. 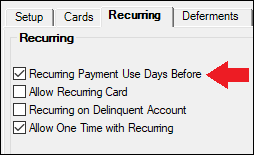 Instead, the screen automatically defaults to the recurring payment to be pulled on the Due Date. The user will need to select the payment frequency Monthly and set the Start Date using the calendar date picker. In the example below, we will set the recurring payment three days before the Due Date of February 28. 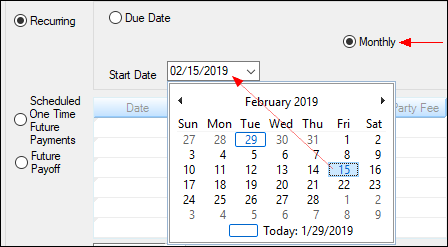 Using the calendar date picker, we select February 25. With the Recurring Payment Use Days Before option off, it is more cumbersome if your institution will only allow for payments to be a maximum of nine days prior to the Due Date. Using the calendar does have its advantages, though, when allowing the user to set any day of the month for the payment Start Date. Your institution can decide which option would work best for your employees setting up payments in EZPay. Another possibility your institution has with EZPay is to not allow any payment other than the Due Date. If this is something your institution would like, your GOLDPoint Systems account manager can set your EZPay IMAC table so that both Recurring Payment Use Days Before and ACH options are unchecked. This is very limiting and allows for no manipulation of the payment dates. In the example below the only option available to process for recurring is the Due Date. If your institution uses multiple payment frequency options (Monthly, Semi-Monthly, Bi-Weekly, or Weekly), the user must be aware of limitations to a weekly payment frequency. If a loan frequency is set for weekly, there is one caveat with the Recurring Payment Using Days Before drop list. Weekly payments can only go out to a maximum of three days prior to the due date. This is programmed to avoid issues with amortizing of the loans by allowing payments earlier than the actual payment frequency of seven days. The EZPay screen is a versatile screen that can be set up to your institution’s best advantage. 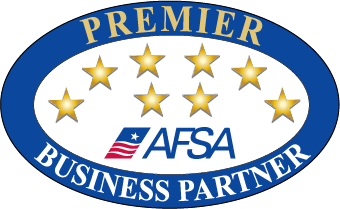 If you are interested in applying any of these options mentioned in this article, please contact your GOLDPoint Systems account manager. Also refer to the EZPay Options topic in the Loans in CIM GOLD manual in DocsOnWeb for details concerning all the options available for the EZPay screen.